Dairy Queen Is Giving Everyone Free Blizzards. Here's How You Get One. Blizzard is either the worst or best word depending on what time of year it is. In the winter, it’s a repulsive signal of everything that’s terrible about the season. In the summer, it’s a sign of relief from the oppressive heat and humidity. Good news! 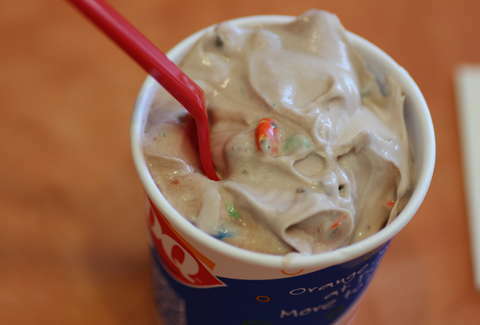 It’s still summer, and there are free Blizzards to be had. Download the DQ mobile app, and sign up for the reward program. (A name, email, and phone number is all that's required.) If you’re new to the app, you'll get a totally free small Blizzard. Just be sure to sign up around the time you want to redeem the offer because the coupon that’s automatically loaded into your account is only valid for one week. The Blizzard can be claimed at participating locations, which excludes restaurants in Canada and Texas. If you’ve already signed up, there are treats available for you as well. Through September 2, the mobile app has coupons for buy-one-get-one-free small sundaes and buy-one-get-one-free shakes and malts of any size. Labor Day may be a sign of summer’s approaching swan song, but it doesn’t have to be the end of enjoying ice cream. Get it while you can.